Throughout the month of December, Racer X Online editors and contributors will be handing out one award each day for an outstanding performance or effort or product related to the global motocross industry in 2018. Each winner will receive this award, which we’re calling a Roger, just like the Academy Awards have their Oscars. It’s in honor of Roger DeCoster, a great ambassador for the sport of motocross for more than 50 years. Today’s topic is Supercross Race of the Year. There is no time like the early time of Monster Energy Supercross, when the full field is healthy, ready and confident, and few are over-thinking the points chase or nursing injuries. The first five rounds usually deliver great heat, so it’s no surprise the most exciting bar-to-bar action in 2018 came at round five, in Oakland. 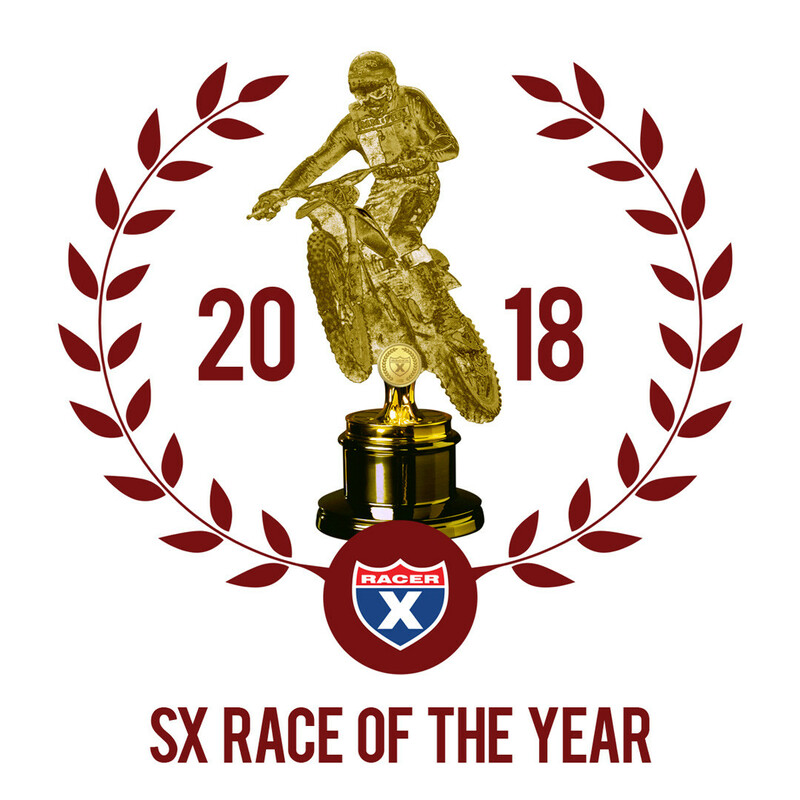 As such, it takes the Roger as Racer X Supercross Race of the Year. Oakland was the race you’d script if you wanted to write a plot from home. It featured a gnarly, rutted track that led to mistakes and also allowed riders to make up huge ground if they were willing to run the risk—or as a reward for staying precise on a technical surface. It also had storylines. Early, Cole Seely grabbed the holeshot and set sail, pulling away from the field in hopes of taking his second career race win and first since 2015. The rutted track reached up and bit him, though, as he cross-rutted his CRF450R and crashed off the side of a jump. This put his Honda HRC teammate Ken Roczen in the lead, and as the laps clicked off, everyone started to envision Ken getting his first race win since returning from a devastating arm injury suffered a year earlier. Ken looked good, but a challenger was starting to emerge through the pack. Jason Anderson, the series’ points leader, was throwing all caution to the wind and getting aggressive to make passes. 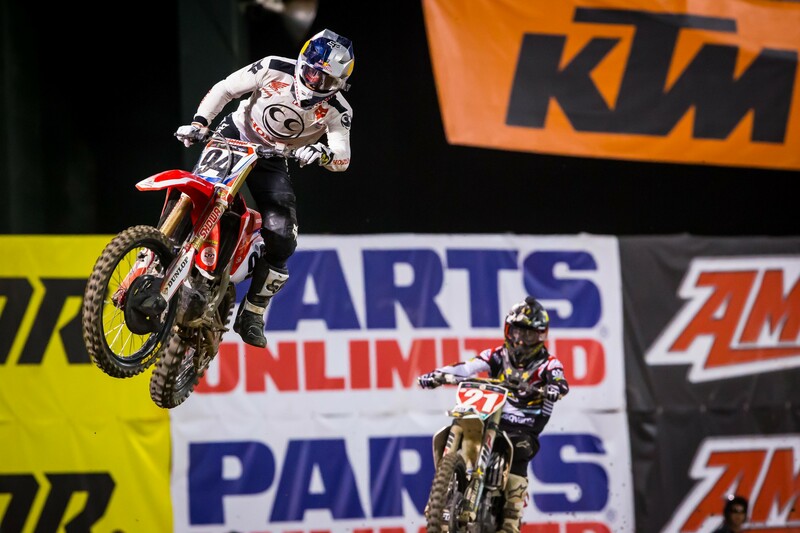 One highly-publicized move was on his training mate Marvin Musquin. Anderson blitzed the whoops hard, dove deep to the exit of the following corner, and took Marvin down. Still, Roczen had a solid lead with two laps to go. Then he made a big bobble of his own and blew a rhythm section. Anderson nailed the jumps and then carried that momentum into the whoops to take the lead. It was short-lived, as Anderson then made a mistake in the next rhythm lane, leading him to overshoot a corner and lose his drive. Roczen pounced, and the duo spent the next half of a lap side-by-side through jumps and corners, getting aggressive yet also leaving enough room to keep the fight going. Incredibly, they even flashed across the finish line to take the white flag side-by-side. The fans were going crazy. Despite repeated attempts by Anderson, Roczen managed to secure the lead with half a lap to go. Getting desperate, Anderson gave the whoops a shot at about Mach 3, but the speed was too much and he nearly threw his Rockstar Energy Husqvarna away. Now Roczen had a small gap with just three turns remaining, but he failed to jump onto the next on-off tabletop cleanly, and lost his momentum. Anderson shot past to retake the lead, and now Roczen would have to hope Anderson bobbled again in the final moments. Anderson hung tough, kept the door closed in the final turn, and sailed to his second win of the season—and probably the most dramatic of his career. It was insane, and definitely the best race of the year. While other Monster Energy Supercross races this season delivered on drama—like the Musquin/Tomac tangle at Foxborough—or feel-good stories—like Justin Brayton’s big breakthrough at Daytona—no race featured more contenders and so many back and forth passes right down to wire. For that, Oakland grabs the Roger.